AllegroMedical.com presents The Sure Hand Bendable Utensils. A twist in the metal shaft allows bending to the right or left at any angle, for customization to individual’s self- feeding needs. Latex free. Comfortable grip. Sure Hand Utensils have a soft, non-slip grip with an extra-wide lip on the handle to stabilize grip and stop the hand from slipping forward. Handles are 1-1/2" in diameter and 4 1/2" Long. Grips are mixture of plastic and rubber. Durable and long-lasting. Ribbing allows easy cleaning and resists particle build-up. Stainless-steel utensils are institutional dishwasher-safe to 180°F and latex free. Easy to use. The round handle is a natural fit for those with arthritis, weak grasp, stroke or other neurological impairments. My grip and coordination are less than reliable, and for a long time I've been reluctant to eat in front of people I don't know well. 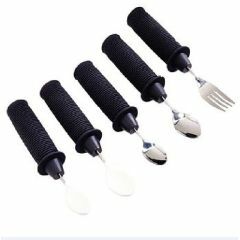 With these utensils, I can focus on the company without worrying about about the mechanics of eating. I have used straight (non-angled) cutlery with built-up plastic handles before, and these utensils are much better for me. The handles are softer and less slippery than plastic, making for a surer grip, and the ability to angle the "business end" of the utensil makes eating a much more natural motion that eases stress on my hand, wrist, and arm.